Liven up your lunchtimes with these gorgeous toasties. Slice the chicken into strips about 1cm thick. Crush the cumin and coriander seeds using a pestle and mortar. Mix with the chill seasoning and a little salt and coat the chicken pieces by placing the ingredients in a polythene bag and shaking well. Place on a foil lined grill rack and drizzle with 1 tablespoon of the oil. Cook under a moderate grill for 12-15 minutes, turning once until cooked through. Halve and stone the avocado. Scoop the flesh into a bowl and lightly mash with the coriander and a little seasoning. Split the rolls in half. 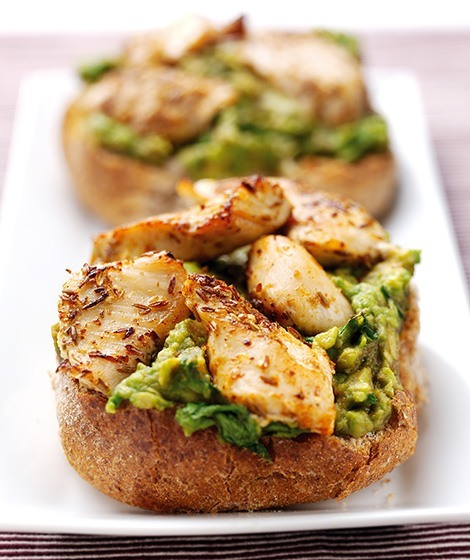 Drizzle the cut sides of the rolls or bread with the remaining 1 tablespoon of oil and pile the avocado and chicken mixture on the rolls or bread slices. Toast them for about 2 minutes or until warmed through. Alternatively use a Panini machine and sandwich the filling on the bread or rolls. If you like really spicy flavours, add a dash of hot chilli sauce to the avocado mixture.